One of the myths of home accessibility is that houses need to be especially large. There’s a concern that wider doorways and halls mean that everything is larger. Since ramps take up more room than stairs (an 8-in high step translates to an 8-ft long ramp), the natural assumption is that other items expand exponentially—bigger kitchens and bathrooms and living/sleeping/dining areas. Yes, it’s true that some spaces are larger, but others can be smaller. Thoughtfully-designed kitchens put appliances and storage within easy reach, shortening the distances to be navigated in a wheelchair with a lap full of supplies. Pocket doors put wall areas to use for furniture and accessories, avoiding the arc of a swinging door or the need to find space to step aside while the door is opening. Removing a wall altogether expands useable space by consolidating aisles between furnishings in adjacent rooms. And built-in furnishings make efficient use of wall and floor areas because they are tailored to available space. And they are also sturdy enough to support a person walking or transferring from mobility devices. Let’s look at two very small homes, different because of the geographical constraints of their settings but also because of the lifestyles of their inhabitants. This tiny house in Washington state was designed by architect Emory Baldwin. He calls it FabCab, and it’s indeed a fabulous cabin, designed as a pre-fabricated home that can be easily delivered and set up on site. At only 557 square-feet, it has everything a one-bedroom home needs. There is a full yet compact kitchen and a fully-accessible bathroom with a wheelchair-friendly roll-in shower. Open-plan living—a combined living-dining space—puts everything within reach and in view, inside and outside the home. Triple pocket doors in frosted glass connect the bedroom and living areas. These can be closed for privacy or opened up to gain a sense of space. Bi-fold closet doors take up very little space when open, keeping passageways clear for furnishings and travel. A thoughtful palette of compatible colors and materials adds a soothing presence, so important in small-space living. Designed with a place for everything, FabCab has all the necessary functions of a full home. Here is another small home designed as a prototype for empty-nesters in Louisiana. At 800 square feet, it is a little larger than FabCab, but still well below the average size of a new home in America, which peaked at 2,521 square feet in 2007. Called BeauSoleil by its designers—a team of architecture students at the University of Louisiana in Lafayette—this house is designed around the activities of cooking and entertaining. Unlike the compact layout that conserves heat in colder regions, BeauSoleil is distinctly a warm-weather house. The floor plan strings together rooms with generous windows and bump-outs for plenty of cross-ventilation. 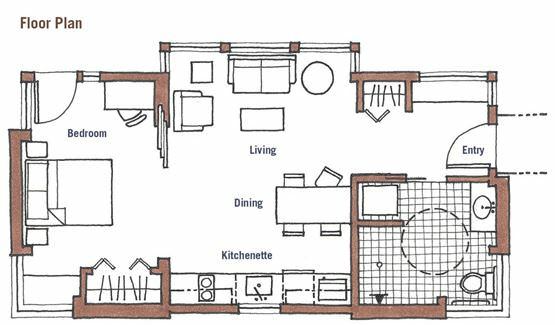 Starting from the left, the plan features a kitchen, dining, and living space, then an accessible bathroom and a combination bedroom-study. Like FabCab, the layout is flexible in terms of room use—an important quality of small spaces. Built-in cabinetry and a Murphy bed allow the room at the right to double as a study or a bedroom. The dining table is placed in a transitional space—pivoting glass walls connect this space to adjacent rooms or to the outdoors. For more on Deborah Pierce and her book, The Accessible Home, visit http://www.piercelambarchitects.com/TheAccessibleHome.html.